Tall, lovely and just right for any occasion! An artistic mix of flowers such as hydrangea, lisianthus and calla lilies in complementary shades of white and purple - arranged in a leaf-lined vase - is wonderfully stylish, and will bring pleasure to someone's day. &lt;p&gt;&lt;br&gt; Each Artistic Mix arrangement will be one of a kind and consist of fresh, seasonal flowers. ***The arrangement depicted in the photo is just one example of our Artistic Mix Vase Arrangement. 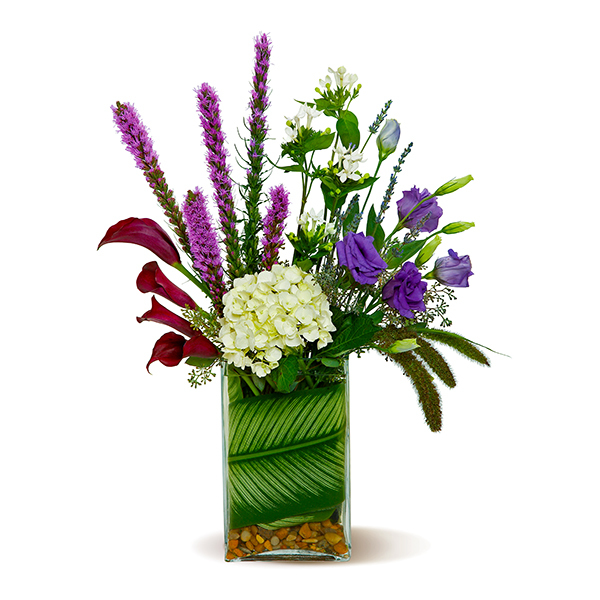 Actual arrangement may vary in terms of flower type, color scheme, and overall design depending on seasonal and local availability - but will be similar in size and include flowers of equal value. Tall, lovely and just right for any occasion! An artistic mix of flowers such as hydrangea, lisianthus and calla lilies in complementary shades of white and purple - arranged in a leaf-lined vase - is wonderfully stylish, and will bring pleasure to someone's day. &lt;p&gt;&lt;br&gt; Each Artistic Mix arrangement will be one of a kind and consist of fresh, seasonal flowers.